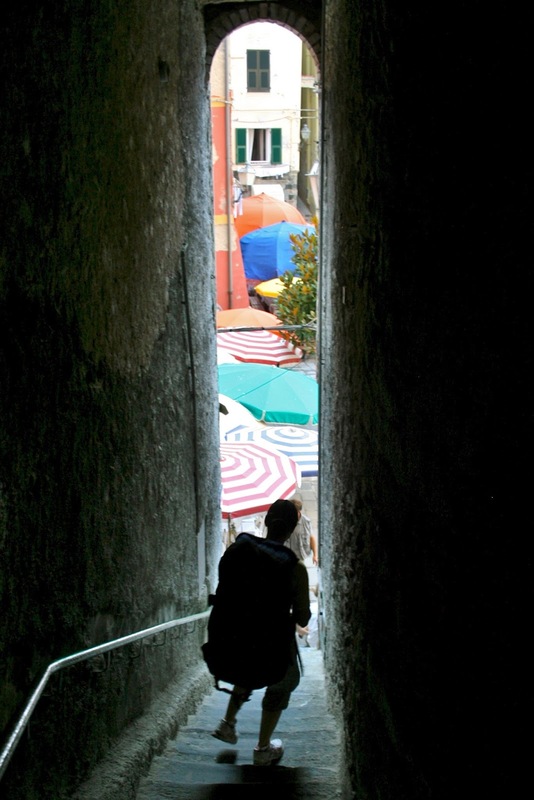 A Path To Lunch: Every Answer You Need for Your Cinque Terre Trip. Every Answer You Need for Your Cinque Terre Trip. Your Visit Made Easy with Our Travel Guide to Cinque Terre. Local Experts Answer 103 FAQ's. Your fellow Italian travelers give clear answers on every Cinque Terre subject. Get detailed info from experienced travelers on every aspect of the Cinque Terre. When to Go, How Long to Stay, What to See, Best Villages, Avoiding Crowds, Best Guidebook, Parking for the Cinque Terre, etc. We are Mike and Martha from Boston & Italy and we explain more about ourselves at the bottom of the article. You will have a great visit to Italy's Cinque Terre region. We will also help you decide if you should get a Cinque Terre Card; which food specialties to eat; find your favorite activity; allay mobility concerns; what to do with children; and even decide what to do if it rains. You should know that, despite erroneous past news reports, there are no restrictions or quotas or limits or required reservations for travelers to the Cinque Terre. To insure an enjoyable experience, the total number of hikers on a few sections of most popular Blue trail is limited to 500 (beginning in June, 2018). The Park says this restriction will affect only peak times on peak days. 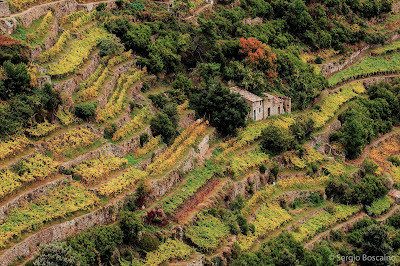 What are the Cinque Terre Questions about the villages, the land, the fame, the trails. When to Go . Weather, the temperatures, the crowds, off season, winter. How Long to Stay One day, Four Days,Ten Days. Cinque Terre Card & App Get the CT Card & the new Official Cinque Terre Park Hiking App. What to See & Do Sights by Town, Activities, for you, for kids, for teens, in the rain. What & Where to Eat Food specialties, Wine, Restaurant Suggestions,Veggie, Gluten-free. Information Questions Guidebooks, Maps, Language, Tour Guides, Websites. Metaphysical Questions The good, the bad, the missing, expense, crime, safety, gay-friendly. Cell phone, wifi, internet Signal availability, apps, wifi & getting advice. Cars, Parking, Car Hire Driving advice, ZTL, dropping off & getting a rental car, parking advice. Limited Mobility Issues Stairs, Access, Other lovely level Ligurian Towns. Click Liguria / Cinque Terre / Portofino Map to see the Cinque Terre towns & nearby Base towns. What are the Cinque Terre? 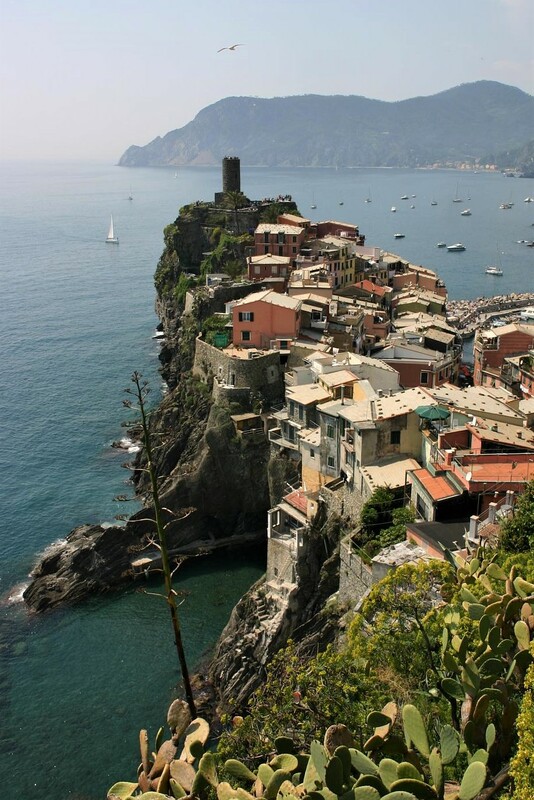 The Cinque Terre are five small villages and the surrounding coastline in the region of Liguria, Italy. Because land access was (and is) difficult, there has been little modern development. As a result the dramatic, rugged coastline and the five little towns have a timeless romantic aspect. The Cinque Terre along with Portovenere is an Italian National Park and a United Nations' UNESCO World Heritage Site. The five villages have become extremely popular with tourists of every nation, and the Cinque Terre Park is a famous hiking destination thanks to its trails over the stunning seaside hills and through vineyards. What are the five villages of the Cinque Terre? Riomaggiore Characteristic and closest to La Spezia. Palmaria are also included in the Cinque Terre UNESCO World Heritage Site designation. Which Cinque Terre village is the best? Vernazza is the prettiest and the cutest and the most evocative. Manarola is the next prettiest and at its best at sunset. Monterosso has the best accommodations and the best beach. Corniglia has the best views. Riomaggiore has characteristic towering buildings . You can have a great trip to the Cinque Terre, but you really must learn and plan. The numbers tell you why. There are six million visitors each year to these five small towns which have a total of 4,000 residents - more visitors per resident than Venice. * We have specific advice below to help you minimize the crowds you encounter. We are not travel writers, we are fellow travelers, so the answers here are intentionally frank. Bear in mind that some of our answers will reflect our orientation toward visitors coming to Italy from abroad on a trip of one to four weeks. We are recently retired photo editors Mike and Martha from Boston and we explain more about ourselves below. What are the Cinque Terre villages like? Vernazza The prettiest, most celebrated town with the most visitors. You really should see it. Photographers love this town, especially at sunset, since the nearby hills provide stunning views. While many consider Vernazza the best village in Cinque Terre, it's also the most crowded. Corniglia The village sits prettily on a promontory high above the sea. Corniglia has an historic church and is the least crowded, the quietest, and the smallest village in Cinque Terre. It's a climb from the train and the boat doesn't stop here, but it's very romantic and the views are the best. Riomaggiore Closest to La Spezia & Portovenere, it's very characteristic. Colorful stacked homes line the opening in the cliff and there's another wee harbor. Kayak rentals and small boat tours available here. Riomaggiore has a good combination of access, beauty, and services. We use Booking.com because -Clear Cancellation Policy -Verified Reviews -Good Search Filters. Evaluate Base Towns outside the Cinque Terre. We describe 14 possible cities & towns. Use of the links above does not affect prices. See About Us and Disclosures below. How many people live in the Cinque Terre? The total legal resident population is about 4,150 people. The population is much higher in summer, of course, as there are many second homes. Counts available from the Italian census are grouped by comune rather than village. How do you pronounce Cinque Terre? What does Cinque Terre mean? Cinque Terre is pronounced Chink-way Ter-ray. Cinque means 'five' and Terre is the plural of terra meaning 'earth' or 'land'. Thus Cinque Terre means 'five lands' in the sense of five territories. The term is plural when used in Italian, but in English it takes a singular verb when you mean the region and a plural verb when referring to the villages. It is sometimes written informally as '5Terre'. Will I need a ticket or reservation to visit the Cinque Terre? Are there limits or quotas on the number of visitors to the Cinque Terre? There are no general restrictions of any kind on visitors to the Cinque Terre villages or Park. No reservations are required and no admission is charged except for a few popular trails. The news stories of limitations on visitors were based on misinterpreted information and has been firmly refuted at every level. 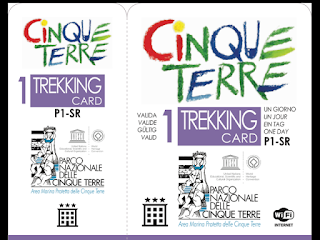 Purchase of a Cinque Terre Card is required to hike several of the most popular trails, but the majority of trails are without fee. To insure an enjoyable experience, there are limits on the total number of hikers on a few sections of most popular Blue trail (beginning in June, 2018). See our information about the Cinque Terre Card below. Why visit the Cinque Terre? What are the Cinque Terre famous for? Cinque Terre is famous for five romantic villages and a stunning coastline. Three of the villages (Vernazza, Manarola, Riomaggiore) consist of hillside ranks of colorful old buildings around miniscule harbors and along a stream between large hills. One old village is on a hilltop (Corniglia) with views over hill and sea. The overall effect is a feeling that you've stepped back in time and the world is right again. The sight of the sea and of the looming green hills are always nearby as nature was always meant to be. In the early morning and in the evening, the golden light, the hills, the sea, and the villages provide images that are timeless and often magical. The landscape surrounding the villages is an extraordinarily beautiful area of rugged hills meeting the sea and is often covered with terraced vineyards. The Park is a well known hiking destination with an extensive network of steep hilly trails with constantly stunning views. What is the Cinque Terre Trail walk like? The 'Cinque Terre Trail' is a misnomer, and there's no such trail. There is a network of dozens of trails crossing the breath-taking landscape of the Cinque Terre National Park. A few require the Cinque Terre Card - Trekking (see below), but most trails are free. The most popular trail is the Blue Trail (Trail #2), and the most popular section is from Vernazza to Monterosso. Note that some Blue Trail sections may be closed for repair, and that popular very often means crowded. To insure an enjoyable experience, there are limits on the total number of hikers on a few sections of most popular Blue trail (beginning in June, 2018). Are the Cinque Terre hiking trails closed? Emphatically no. There are dozens of Cinque Terre trails and only a few are closed at any given moment. Closure may be for temporary conditions or for repair work. Hikers should check trail closures before starting at: Trail Status Update Cinque Terre National Park (hint - the big red circle means closed). Will the Via dell'Amore (Lover's Walk) be open when we visit Cinque Terre? Probably not, the latest estimate for the opening of the Via dell'Amore is spring, 2021. The Via dell'Amore is part of the Blue Trail #2. However, there are other trails open to visitors that provide many equally beautiful views. The Welcome Center personnel in any Cinque Terre village can point you to the trail best for you. Link To: Cinque Terre on Booking.com We use Booking.com because we like the verified reviews, good search filters, good maps, and clear cancellation policies. Use of the link helps pay for this site. Use of the link above does not affect prices. See About Us and Disclosures below. When should we visit the Cinque Terre? The Cinque Terre has a moderate climate so visits between late March and late October are most enjoyable. That period is when the ferries are running, the restaurants and hotels are all open. The landscape is green and pretty and the sea is on its best behavior. When is the best weather for visiting the Cinque Terre? Spring in Liguria. Taken April 24 in Lerici, 8 miles from Cinque Terre. Spring has the best weather for visiting the Cinque Terre. The period from April 20 to June 10 is ideal. Spring has arrived, and it's glorious. Before that time, rain is somewhat more likely, and after that heat is more likely. Second best is Sept. 10 to October 10 as the heat has passed and stormy weather is not too likely. We have given more details in our story: Spring Weather in Liguria. Is it too hot to visit Cinque Terre in the summer? Is Cinque Terre too hot in June, July and August? You can have a very enjoyable summer visit to the Cinque Terre. From June through August, the normal temperatures are not excessive. Since it's near the sea and surrounded by hills, it is typically more pleasant than inland areas such as Florence. However, the Cinque Terre sometimes can get uncomfortable for physical exercise and sleeping without air conditioning, so be ready to adapt your activities to suit if needed. Hikers should remember that Cinque Terre has a western exposure, so afternoons will be warmer than mornings. In July & August of 2017 - a record hot year in Italy - the weekday high temperature at La Spezia hit 32C (90F) only seven times and 33C (92F) just once. The low temperature on many of those days was 22C (72F). Cinque Terre would usually be a tad cooler and breezier than La Spezia. La Spezia Weather Stat Archive. What will the temperature be for our visit to Cinque Terre? It is a temperate climate with moderately warm summers and cool winters. Summers are dry, and winters are characterized by rainy periods sometimes lasting several days. Freezing temperature are unusual, and snow is very rare. Useful weather statistics are here Cinque Terre Weather Averages. How can we avoid the crowds in the Cinque Terre? Realistically, you are likely to encounter some crowding at times, but you can still have a very enjoyable trip. Informed travelers can manage the inconvenience by avoiding the most crowded dates, by arranging the day's schedule, by avoiding the main streets in midday, and by choosing activities away from the major attractions. See the next question - and we've written a special article to help: Cinque Terre-16 Tips for Avoiding the Crowds. Which days are holidays in the Cinque Terre? When are the most crowded holidays in the Cinque Terre? Some holidays are predictably crowded in the Cinque Terre and most visitors prefer to avoid those dates. When they occur in good weather the result can be total gridlock on some of the main streets and train stations. In 2017, 95,000 people visited these five small towns over the 3 day Easter weekend. ** If possible, try not to schedule your trip around the following holidays and associated weekends: Holy Saturday, Easter Sunday, and Easter Monday; Liberation Day (April 25); May Day (May 1); Festa della Repubblica (June 2); Ferragosto/Assumption (August 15). In 2019, we'd try to avoid April 20, 21, 22, 25, 26, 27, 28; May 1; June 1, 2; August 15, 16, 17, 18. Is it too crowded to visit Cinque Terre in summer?. The Cinque Terre are not universally crowded in summer, and you can have an enjoyable visit. There are some extra considerations. Try to avoid the main streets and train stations in mid-day. Because hotels and 2nd homes will all be occupied, the restaurants, cafes, and bars will be busier in the evenings and reservations or good timing are wise. The beaches will be busy almost every day, so arriving before mid-morning is a useful tactic. Which Day is Most Crowded in the Cinque Terre? Wednesday is often especially crowded due to a large cruise ship landing in La Spezia on Wednesday morning each week. Sundays in good weather are often quite busy as well. What time of day is the most crowded in the Cinque Terre? The most congestion in the Cinque Terre occurs from 10 am to 4 pm and is concentrated on the trains stations and the main street. It is during those mid-day hours that most tours and daytrips occur. In compensation, many visitors mention how mornings are especially enjoyable in the Cinque Terre. The coastline faces west and there are mountains to the east, so the morning light is lovely and it is coolest then. When is off-season in the Cinque Terre? With only slight exaggeration, there is no off-season in Cinque Terre. The Cinque Terre are always busy when it's worth going, and that's from April through October. Yes, March and November can have beautiful enjoyable weather, but they can also be wipeouts. We think those months are for visitors who can change their schedule according to weather forecasts. If you are planning a whole trip to Italy from abroad, it makes no sense to lock yourself in when the weather might be bad. Should we visit Cinque Terre in December, January, February? No, it's winter in the northern hemisphere (44 degrees latitude), and the place is practically deserted. Most hotels and restaurants are closed - for example, in the largest small town of Monterosso, only two restaurants and two bars stay open in January. The hotel rooms are often poorly heated, the streets are empty like a disaster movie, the landscape is dormant, windy rainstorms can make trails and streets a torment, there's no ferry service. The days are short (less than 9 hours in December) and there are no museums or events. The biggest draw is the lighted hillside presepe (nativity scene) in Manarola, and that happens in the dark. Visit when it's nice – that's why the place is famous. 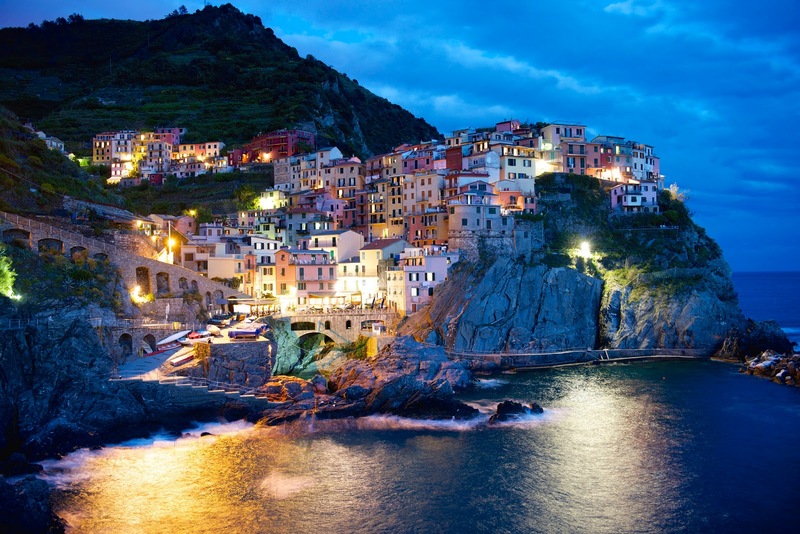 How many nights should we stay in Cinque Terre? How much time do you need to see Cinque Terre? 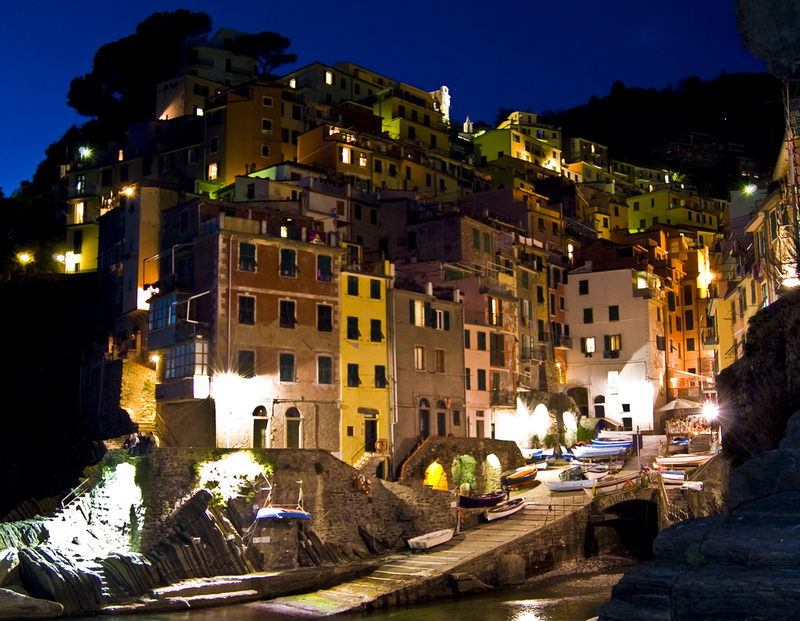 For most international visitors, we'd suggest between two nights and four nights for a visit to the Cinque Terre. That said, it really depends on the kind of trip you want (see the next questions). For a typical travel schedule, two nights means you'll have one whole day - plus an evening and a morning. You'll have time to take a morning hike, see several villages at your leisure, see two sunsets, and experience some of the land- and sea-scapes. With four days, you can linger in all the villages, take several hikes, visit Portovenere and perhaps La Spezia, rent a kayak or sunbathe, and revisit your favorite village at night. Cinque Terre Ferry underway. Sun above, shade below. Yes, it's not optimum, but you can have a great one day visit to the Cinque Terre. You'll need to plan well, and try hard to arrive early. There's no need to see all five villages since they are similar in many respects. Arrive and leave by train and try to use the ferry between Cinque Terre villages to experience the sea and the landscape. Try some hiking to experience the Cinque Terre hills, even if you just walk up to a Sanctuary and down. We'd rank the villages thus for a short visit from best to good: Vernazza, Manarola, Corniglia, Riomaggiore, Monterosso. Note that Corniglia is not a ferry stop, and is well uphill from the train station. If coming from Firenze, in 2018 the best option to optimize is the 7.36 Frecciabianca from Firenze Campo di Marte arriving at La Spezia Centrale at 09.12 and return on the 20.02 from La Spezia Centrale arriving at Campo Di Marte at 21.40. These are not the only options but they are quick with comfortable connections and discounted fares may be available if booked on line in advance. Is there enough to do for a week in Cinque Terre? What is the Cinque Terre Card (Trekking)? What is the Cinque Terre Card (Treno)? 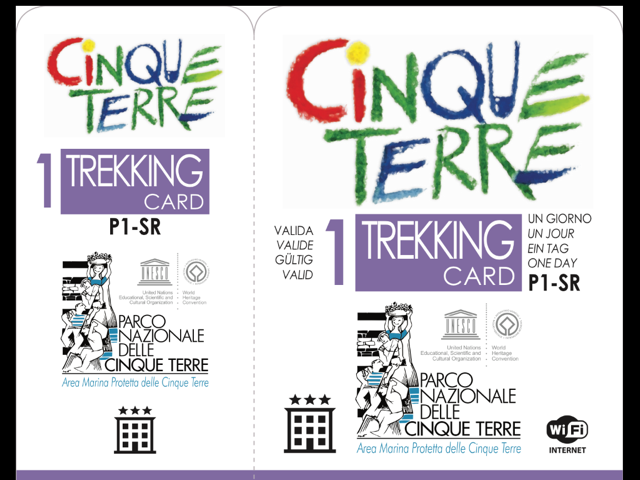 The Cinque Terre Card has two versions: Trekking & Train. The Cinque Terre Card provides admission to the restricted popular trails, the Park's buses, wifi access near the trains, some Park events such as guided hikes and tours, and discounts in La Spezia's Museums. The Cinque Terre Pass comes in two forms, Trekking and Treno (Train). The Treno Card adds unlimited train travel on the Levanto - Cinque Terre - La Spezia line to the Trekking Card's benefits. The cards are offered in different variations: 1 or 2 or 3 day; adult or child (4-12) or family or over 70. Not all possible combinations are offered. Prices for the Cinque Terre Card as of Jan. 2018 for Adult were: Trekking 1 day €7.50, 2 day €14.50 Treno 1 day €16.00, 2 day €29.00, 3 day €41.00. There are lower prices for children and over 70 years old. There's also a special Family price. If you're an active visitor using the trains to get around, the Treno card is usually a value and it's really convenient. You must validate the Treno card on your first trip! For the latest: Cinque Terre Card Prices. The Cinque Terre Cards are available online at the National Park Website and at the Park Welcome Centers in each of the five Cinque Terre villages as well as La Spezia and Levanto train stations. If you start hiking a restricted trail, you can also buy a Cinque Terre Trekking Card from the handsome employee at the checkpoint. Many Cinque Terre accommodations can provide guests with a discount voucher for use at a Park Welcome Center. If you buy the Cinque Terre Treno card online, you must specify the applicable date(s) and then you do not need to validate the card upon first use. One advantage to buying the card online is avoiding waiting in line at the La Spezia or Levanto train station Welcome Center as many new arrivals need the Cinque Terre Treno card in order to take the train, especially in the morning. What Does the new Cinque Terre Park App Do? The app is called "Cinque Terre Hiking Guide" and also 'Pn5t Plus' and you want it if you are doing ANY hiking in the Cinque Terre and you have a Smartphone or other suitable device with a GPS. It's available free for both Apple and Android devices in their respective stores and it carries the name and logo of 'Parco Nazionale delle Cinque Terre'. The App allows you to see an overall trail map as well as individual trail maps and to see your position on that trail. The trails also have word descriptions (in English) illustrated with photos at key points, and other goodies including distances, elevations, where to get water, and dialing for assistance. This app was previously known as 'Cinque Terre Hiking Guide VITOUR' and was developed by Charta srl. You may see the App referenced as such in Rick Steves' Guides. What sights are there to see in Cinque Terre? Besides Cinque Terre's fabulous seascapes and vine-covered hills and the villages themselves, visitors can enjoy some very old churches, sanctuaries, and fortifications. While the monuments of Cinque Terre are not famous or richly decorated, the wonder is that they were constructed by the efforts of villages even smaller those of today. Many were built over 600 years ago, almost 30 generations - before the discovery of America. What is there to see in Monterosso? Church of San Giovanni Battista constructed in the 1200s, in Gothic-Genovese style. Concrete statue of the Giant, Il Gigante, representing Neptune, the god of the sea. Statue of San Benedetto d' Assisi, located on a hill above old town. San Francesco Church with a painting of the Crucifixion by Van Dyck (early 1600's). Located on a hill between Fegina and old town, it makes a lovely climb as there are excellent views and one can see the iconic 400 year old Capuchin Monastery and the interesting Monterosso cemetary. What is there to see in Vernazza? Church of Santa Margherita di Antiochia in town, overlooking the sea. Tower of the Doria Castle is all that remains from a 13th C. castle that covered the whole hilltop. The origins of the tower are from the 11th C. It's located on a hill above the town and the small port. What is there to see in Corniglia? 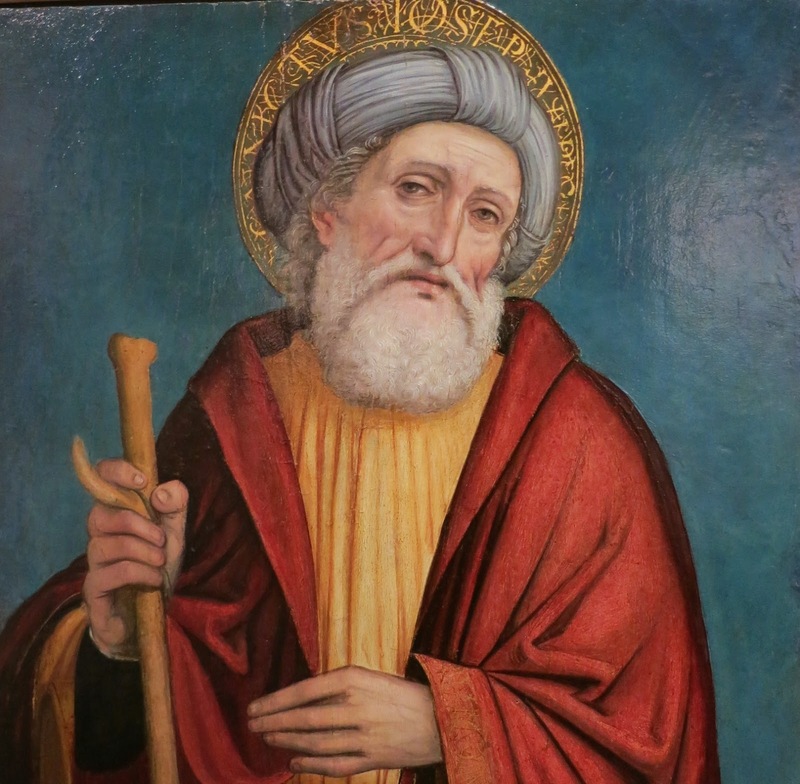 Oratory Santa Caterina An oratory is a church sponsored by parishioners or a lay organization. Parish of San Pietro An important building in gothic Ligurian style from 1334. In the interior a baptismal basin from the XII century, the statues of the evangelists and a polyptych of the Masters of the Church. What is there to see in Manarola? Church of San Lorenzo built in 1338 in Gothic Ligurian style incorporates an ancient watchtower. What is there to see in Riomaggiore? Church of San Giovanni Battista, built in the gothic manner in 1340. 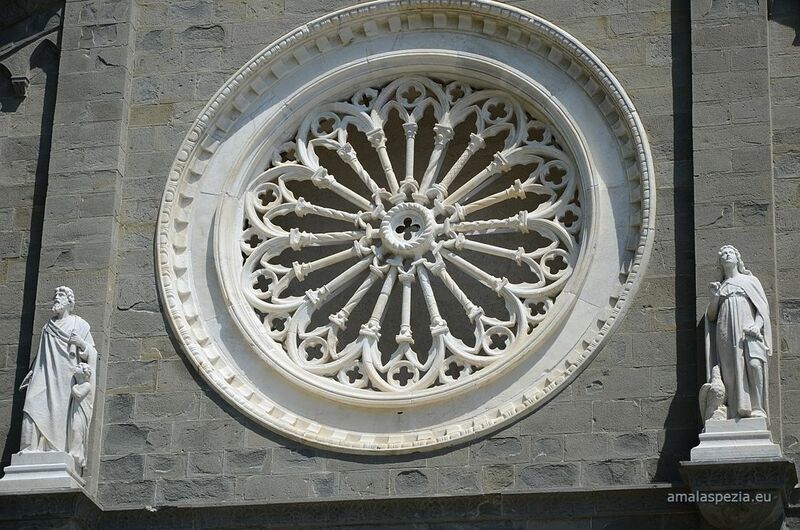 Church of San Lorenzo from 1338 with a beautiful rose window dating to the same period. Castle of Riomaggiore Substantial ruins of a castle built in 1260 (with excellent views). What is The Way of the Sanctuaries (La Via dei Santuari) in the Cinque Terre? The Way of the Sanctuaries is the name given to the fairly arduous trails connecting the five sanctuaries above each Cinque Terre village. It takes about 7 hours to walk The Way, which explains why it's more popular as a mountain bike excursion. However, it's very popular to walk to the Sanctuary above your favorite village as a hike with views. Above Monterosso, Soviore Sanctuary dating from 1244 AD, 400 m. above town, 90 min. or bus. Above Vernazza, Sanctuary of Nostra Signora di Reggio, 1248 AD, 45 min. with a 225 ft. tall cypress tree. Above Corniglia, Sanctuary of Nostra Signora delle Grazie, 17th C. about 1 hour. Above Manarola, Sanctuary of Nostra Signora della Salute, 12th C.Romanesque, about 1 hour. Above Riomaggiore, Sanctuary of Madonna di Montenero, 9th C & 18th C. about 1 hr., panoramic views. What is there to do in Cinque Terre? What activities are available in Cinque Terre? Beside exploring the five Cinque Terre villages, viewing historic buildings, admiring the landscape, and eating great Italian food, major activities include hiking, biking, boating & kayaking, boat tours, diving, fishing, swimming, sunbathing, cooking classes. We give you specific ideas for inspiration below. Is there Biking (Mountain Biking) in the Cinque Terre? Bikes are available for rent at several locations in the Cinque Terre. You will need to inquire at one of the Park Welcome Centers (Centri di accoglienza) for current accurate information. We believe there are rentals at the train stations of Riomaggiore and Manarola as well as the uphill locations of Telegrafo, San Bernadino, and Volastra. Mountain biking is popular in Italy (often abbreviated as MTB) and numerous Cinque Terre hiking trails are adapted to it. The most active center for excursions is the Sanctuary of Our Lady of Montenero )(Santuario di Nostra Signora di Montenero) above Riomaggiore & Manarola. One popular route is called the the Way of the Sanctuaries (La via dei Santuari) which visits all five of Cinque Terre's sanctuaries (see Sights above) - though the real draw is the constant & staggering views. Again, inquire at one of the Park Welcome Centers (Centri di accoglienza) for current accurate trail information. Are there Boat & Ferry Tours in the Cinque Terre? The ferry is a great way to see the Cinque Terre coast. The ferry boat company operates between the Cinque Terre villages, and Portovenere, Lerici, and Levanto. There's no better or easier way to tour the famous coastline than with an on/off ticket (about 35€, 2018). The ferry company also offers a Portofino / San Fruttuoso tour from Cinque Terre in July & August, as well as a short tour of Palmaria, Tino, & Tinetto Islands from Portovenere. For a limited budget, you'd see a good portion of the coast by taking the ferry between Manarola and beautiful Portovenere (13€, 2018) and then busing back to La Spezia. See all the times and fare possibilities here Complete Cinque Terre Ferry Schedules. There are also numerous private boat tours available in Cinque Terre with varying agendas - sunset, lunch, remote swimming, tapas, at night, etc. The tours leave from all four seaside villages - from Monterosso (7 companies), Manarola (2), Vernazza (2), and Riomaggiore (1). While it's not necessary to book far in advance, availability is finite. Some companies with websites: Angelo's Boat Tours - Monterosso Enjoy Cinque Terre - Manarola Nordest Vernazza Cinque Terre dal Mare - Riomaggiore. Are there Boat and Kayak Rentals in the Cinque Terre? 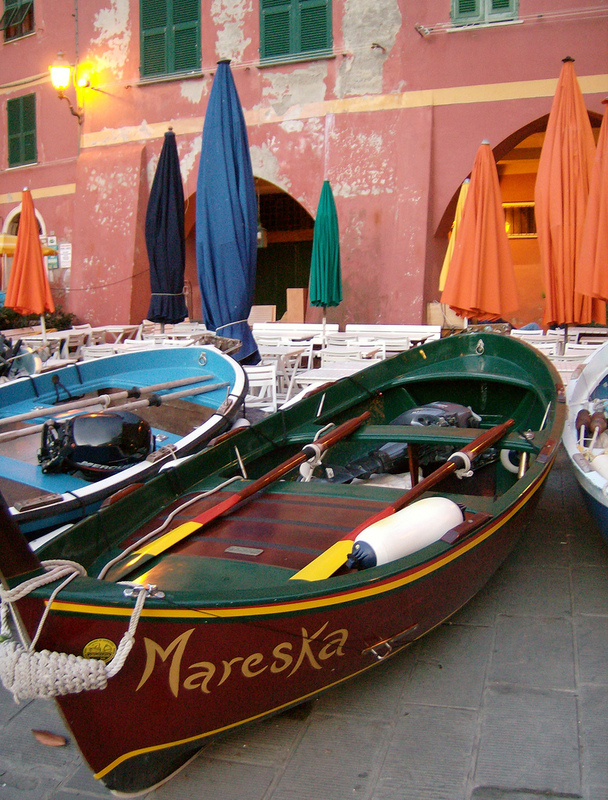 There are many boat and kayak rental options in the Cinque Terre. They are great fun and very popular in good calm weather, it's only 5 miles (straight line) from Monterosso to Riomaggiore, another 6 mi. to Portovenere. See and read a description: Cinque Terre by Kayak. Kayak rentals are available from a number of companies in the four seaside villages (kayak & canoa/canoe can mean the same in Italy). Some examples: In Riomaggiore 5 Terre Dive Center does rentals as well as group kayak tours. 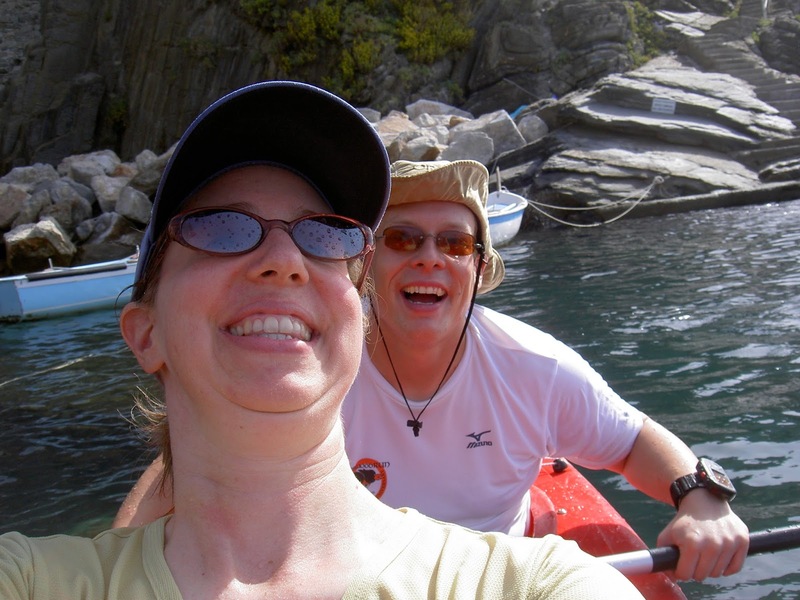 In Manarola, Enjoy Cinque Terre - Manarola rents single and double kayaks. In Vernazza, there's Nordest Vernazza, and in Monterosso there's Samba Kayak which also does paddle boats and snorkel equipment. Aluminum and Rubber Boats with motors are available from Cinque Terre dal Mare in Riomaggiore. No license needed. The boats hold 3/4 people and cost 65 Euro plus fuel for 3 1/2 hours. A Ligurian Traditional Boat called a gozzo can be rented if you are comfortable operating a 4.5m. boat with a 10 hp motor that holds 5 people. No license needed, about 90 Euro for 4 hours. See photos and rates at Nordest Vernazza in Manarola or Cinque Terre dal Mare in Riomaggiore. Is there diving in the Cinque Terre? Is there a Dive Center in the Cinque Terre? The Cinque Terre is an excellent dive location and popular with Italian and visiting divers because it's a Marine Protected Area. The most active dive center is 5 Terre Dive Center in Riomaggiore within the Protected Area. 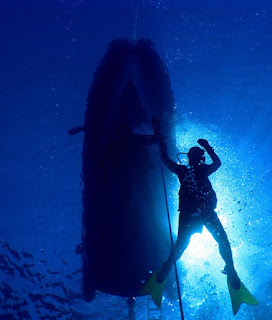 They have excursions available and also rent dive and snorkle equipment as well as giving dive lessons. Is there fishing in the Cinque Terre? In Riomaggiore, a traditional Ligurian boat called a gozzo with captain suitable for up to 6 people can be chartered for sport fishing, equipment included. Information at Cinque Terre dal Mare. Fishing on your own requires a license. While they are not expensive or difficult to obtain, it requires too much time for a temporary visitor. What Hiking is available in the Cinque Terre? What do I need to know about hiking in the Cinque Terre? Hiking in scenic Cinque Terre is a walking dream and there is an extensive network of trails. The hills are steeper than many visitors expect, so keep your expectaions realistic. We will have a separate future article, MEANWHILE in this article...See the Information section below for a good Cinque Terre hiking map link and above is Cinque Terre Card info. See the Cell Phone, Wifi, Internet section below for a description of the Park's Cinque Terre Hiking App. And before you set out, check the Trail Status Update Cinque Terre National Park (hint - the big red circle means closed). Where is the best camping in the Cinque Terre? There are no campgrounds or camp sites in the Cinque Terre and it's against Park regulations to go wild camping or rough camping. There are campgrounds in Levanto and other towns just up the coast from Cinque Terre. One in Levanto is called Camping Acqua Dolce. There are campground listings are here - Camping.it Liguria. Can you swim in Cinque Terre? Can we sunbathe in Cinque Terre? 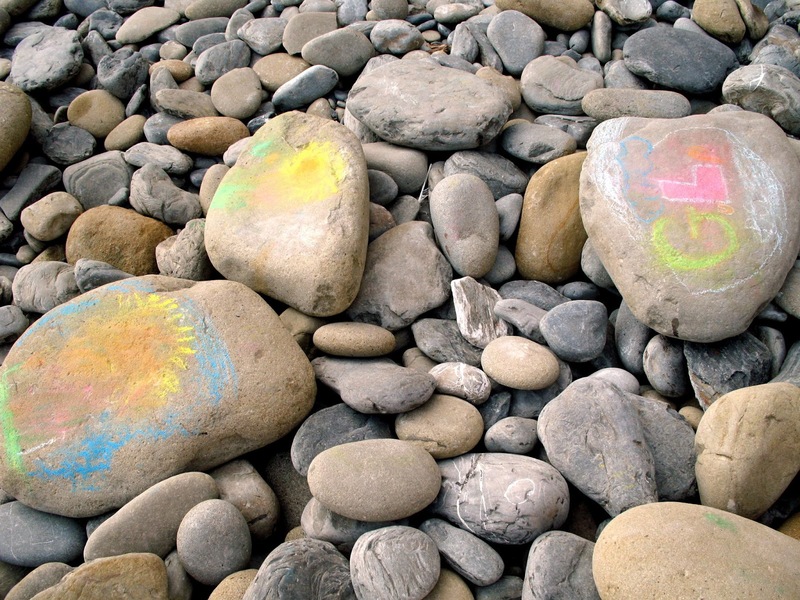 What's there to do for children in the Cinque Terre? 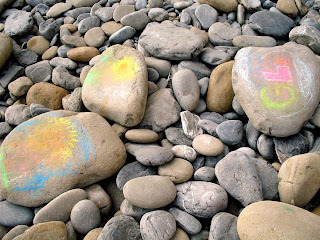 Is the Cinque Terre kid friendly? Are there playgrounds in the Cinque Terre? There are playgrounds in each of the Cinque Terre towns. In Manarola, the playground is uphill from the center and includes a view. In Vernazza, the playground is uphill from the train station, There are two playgrounds in Monterosso, one in Fegina (new part) and one in the old part near the main piazza. In Corniglia and Riomaggiore you may have to ask, and the phrase parco giochi may work better than playground. Levanto has a playground in center of town near the beach. Is there biking for children in the Cinque Terre? It's generally too steep for kids' biking in the Cinque Terre except perhaps for some upslope trails which run parallel to the coast. Inquire at the Welcome Centers. However for school age kids, just north by train in Levanto, you can rent bikes to explore the unique pista ciclabile (bikeable path). This is a flat, paved bike trail along the sea and largely through old (1874) rail tunnels from Levanto to Bonassola to Framura. It's 5.5 km long, and your energetic 10 year old can easily do it in 30 minutes each way. It's also enjoyable as a walk - the tunnels are cool and shady on a hot day and at some points provide different viewpoints on the town and the sea. The four rental bike shops in Levanto are: Cicli Raso, Via Garibaldi 63, near Piazza Cavour; Onda Sport, Via Mazzini; Sensa Freni Bike Shop, Piazza del Popolo 1; Tina e Mario Shop, Corso Roma 3. Rental prices are from 10-15 E per bike per whole day. What's there to do for teens in the Cinque Terre? Besides the beach and hiking, there are boat rentals and mountain bike rentals described above in several of the villages for older teens. In Riomaggiore there are guided group kayak tours available at 5 Terre Dive Center. The Cinque Terre are very safe places in terms of crime, so you can feel (relatively) comfortable letting them go off on their own. What can we do on a rainy day in Cinque Terre? If it's just a passing shower or a light drizzle, take the ferry or train to explore another Cinque Terre village. The ferry also allows you to reach historic Portovenere on the Gulf of La Spezia where there's a castle and quite a different atmosphere Portovenere Travel Guide. If it's a steady rain, take the train to La Spezia, Chiavari, or Genoa. La Spezia has shopping and several interesting museums such as the Lia Museum with excellent Renaissance paintings and the Naval Museum. Your Cinque Terre card includes a discount for many of La Spezia's museums. See this article: La Spezia Travel Guide. Chiavari has sidewalk arcades protected from the weather with nice specialty shops, cafes, and restaurants. Genoa has an amazing old town of tiny streets. There's also a world-class Museum row, Europe's largest Aquarium (by Renzo Piano), a Museum of the Sea with a WWII submarine, an indoor food market (mostly in the morning), as well as shopping and cafes. Visit Genoa Official Website. What can I eat in Cinque Terre? 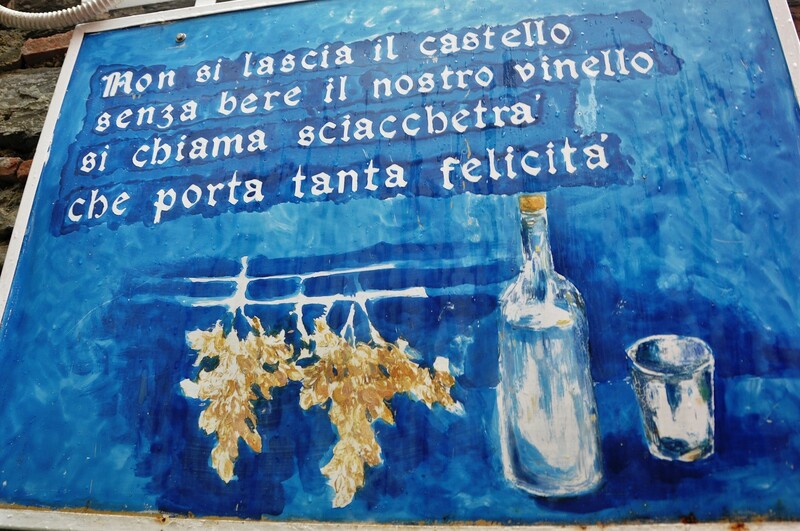 What are the local Cinque Terre food specialties? 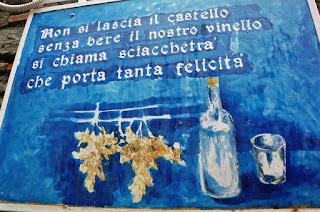 The unique Cinque Terre specialties are Sciacchetrà wine and Monterosso Anchovies (Acciughe di Monterosso), and you really should try both, just not together please. Liguria is the original home of both pesto and focaccia and they are sublimely different here. Look for the authentic version of pesto which includes green beans and potatoes. However, there are also other fabulous Ligurian dishes you'll want to try - such as farinata (chickpea flatbread) and mesciua (a mixed legume soup) and torta di vedura (vegetable pie). We have an article to help you digest all this: A Guide to the Local Food Specialties of La Spezia. What wines are made in the Cinque Terre? La Spezia mussels (cozze or muscoli) are famous in Italy. Which Restaurant in Cinque Terre to celebrate our anniversary or a birthday? The two most mentioned restaurants for celebrating anniversaries and special events in the Cinque Terre are 'Ristorante Miky' and Ristorante L'Ancora della Tortuga both in Monterosso. What's the Best Restaurant in Cinque Terre? Best depends on the diner. Cinque Terre restaurants with full menus of different types we've seen referenced multiple times are Ristorante Belvedere and L'Osteria in Monterosso, Il Pirata and Belforte in Vernazza, Osteria a Cantina de Mananan in Corniglia, Nessun Dorma and Trattoria dal Billy in Manarola, and Rio Bistrot in Riomaggiore. What can a vegetarian eat in Cinque Terre? In Cinque Terre, there will be vegetarian choices at every restaurant with a full menu, even though there is no exclusively vegetarian restaurant. Traditional Ligurian dishes are often vegetarian. Some examples are pesto with pasta (often with trofie - a local pasta), pansotti (a type of cheese filled ravioli) usually with nut sauce, pasta with funghi (mushrooms) and ravioli filled with boragine (a tasty green). Frequently, pasta shapes are offered with a choice of sauce including marinara (simple tomato) or butter-and-sage. There will be salad and vegetable sides, possibly vegetable pie, and there are often soups such as minestrone and the local specialty mesciua. Focaccia with different toppings may be offered, however it is sometimes made with lard, so you should ask. As a street snack, if you're lucky enough to find farinata you will be enchanted by this chickpea magic. Gluten-free beer and pizza notice in shop window. Do restaurants offer gluten-free dishes for diners with celiac disease in Cinque Terre? Yes, gluten-free offerings are widespread in Italy and the Cinque Terre. Many full menu restaurants will have a couple of special gluten-free options, and others will offer to adapt menu items on request. Specialty food outlets such as pizzerias very often have special dishes for 'celiaci'. The BEST NEWS: the Ligurian specialty street food farinata made from chickpeas is gluten-free. Available for sure in Monterosso on Via Gioberti and in Manarola at Pizzeria La Cambusa. First, buy your Cinque Terre guidebook before you arrive as you won't easily find them in Italy. For a guidebook dedicated to Cinque Terre, we think the best by far is Rick Steves Pocket Cinque Terre (Amazon US) (Amazon UK) (Kindle UK) which also covers Portofino. The Pocket Cinque Terre info is also included in Amazon’s best selling Italy guidebook Italy Rick Steves 2019(Amazon US) (Amazon UK) (UK Kindle Store). For Complete Italy Guidebook Reviews, see our helpful article: Best Italy Guidebooks 2019 Reviewed. Will they speak English in Cinque Terre? Virtually everyone you encounter in stores and services in Cinque Terre will speak passable to excellent English. Do we need an Italian phrasebook? You don't need a phrasebook just for the Cinque Terre, but if your Italy trip is longer we recommend Rick Steves Italy Phrase Book & Dictionary (for UK: Click ). However, the more Italian you know, the more enjoyable your trip: interacting with Italians is great fun. We recommend you at least learn correct Italian pronunciation - it's quite easy - and then you and the waiter can relax. For learning more, look for an online course or Pimsleur Conversational Italian (for UK: Click ). Where is there a Tourist Information Center in Cinque Terre? There is a tourist information center in each of the five Cinque Terre villages as well as at the train stations in La Spezia and Levanto. All the offices are listed here: Park Welcome Centers (Centri di accoglienza). What are the best websites for Cinque Terre information? General. The most direct source is the official Park website Cinque Terre National Park. It has the most current info and it's good for trail updates, welcome office listings, and more. Unfortunately it's not comprehensive, but it can be useful. See our Cell Phone, Wifi, Internet section regarding the Park's free App, 'Cinque Terre Hiking Guide'. Where can I get questions about Cinque Terre answered? Transportation Questions. If you can't solve your Cinque Terre transport problem, the TripAdvisor Liguria Forum or Italy Forum has some very knowledgeable followers. Should we take a tour of Cinque Terre? The Cinque Terre itself is quite easy to do without a tour - there are no places that you cannot access yourself. Read about the villages and the area you'll be visiting, get a good guide book and go. The area is well marked and English is understood. The chief reason to use a tour would be for arranging hotels and meals and transportation to and from the Cinque Terre area. That said, tens of thousands of travelers make those Cinque Terre arrangements themselves each season. Do we need a Private Guide for Cinque Terre? What's the best map for Cinque Terre? The Cinque Terre Park (Parco Nazional delle Cinque Terre) has an excellent map of the hiking trails available at info points. You can see or download it a 5 MB pdf here: Official Cinque Terre National Park Hiking Map There are also commercial maps enhanced in different ways available at every store in Cinque Terre. Map boards have also been erected at key points around the park. No need to buy before you arrive, however check the Park's Trail Status Update Cinque Terre National Park before your visit to see if any trails are closed. What's the best part of visiting the Cinque Terre? Are the Cinque Terre worth visiting? We think the best part of a Cinque Terre visit is the constant visual beauty – it's everywhere: the buildings and their colors, the nestled villages, the color of the sea, the hills and their lines of vine-filled terraces, the innumerable greens of nature, the famous Cinque Terre sunsets, flowers you’ve never seen before, brilliant yellow ginestra trailside, the gentle morning light, the villages at night. The landscapes and seascapes will also amaze you with their grandeur, and they are more impressive than some other famous places (sorry Big Sur and Amalfi Coast). You'll enjoy the food and wine to be sure, and while these specialties are available all over Liguria, somehow the surrounding beauty makes the food and wine more intense. What's the worst part of visiting the Cinque Terre? The worst part of a Cinque Terre visit is our fellow humans. It can get crowded and very crowded; people in tour groups can be oblivious of others; unaware individuals can be boors or act disrespectfully. The restaurants can be crowded, and some of the dishes served are not up to Italian standards. The service workers can become decidedly lackadaisical after a day dealing with a zillion tourists. A few businesses have prices which take extreme advantage of their location. The popular trails can resemble a conga line without the wedding. The heat and sun can really sap your energy especially late in the day. The steepness of the hills can make you seriously question your trip planning judgement. Perhaps worst of all, your gelato will disappear too quickly. What is not available in the Cinque Terre? The Cinque Terre have no museums, relatively few landmark buildings, no large stores, limited shopping opportunities, no movie theaters, no nightclubs, no large music venues, not a lot of nightlife. There are insufficient restaurants and cafes at times compared to the demand. There are no large piazzas, some parts of the towns have few public places to sit, and public restrooms are hard to come by. Only Monterosso has a significant beach. 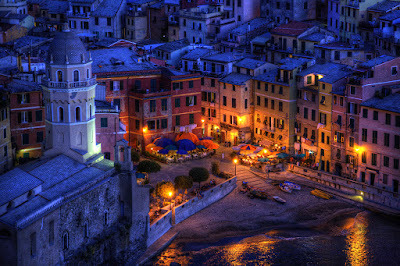 Some of the towns, including the most famous – Vernazza - have no hotel, just BnBs and room rentals. None of the villages have easy access by car, and some have car access that is absolutely terrifying. Only Monterosso has any significant parking possibilities for visitors and the spaces are expensive. There are no car rental offices. There is very limited access for those with impaired mobility (see the FAQ on this below) and there are few easy hikes near the sea. Gelato artigianale means handmade gelato. It's rarely shared. Is the Cinque Terre overrated? The Cinque Terre is deservedly famous because the landscape, the seaside cliffs, the small romantic villages, and the centuries old terraces are incredibly beautiful and unique in the world. Some visitors may think it's overrated due to unrealistic expectations. Large numbers of informed travellers, photographers, and writers can't wait to visit Cinque Terre again. Too popular it may be, overrated it's not. 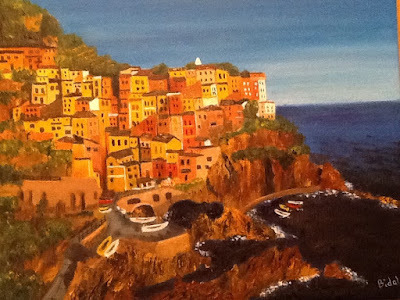 Is it expensive in Cinque Terre? No, the Cinque Terre is less expensive compared to other resort districts in Italy and it's inexpensive when compared to resorts in other parts of Europe. The Cinque Terre is diverse, with options generally available at all economic levels. For comparisons (with suspicious methodology), look at the website Budget Your Trip which lists the Cinque Terre total daily expense at €105 per day and Como in the Lake District at €170 per day. The largest travel expense is accommodation, of course. The website Statista surveyed HotelRoom Prices for beach communities in Italy in 2016 and found Vernazza to be just above the median in price at €96 for the average hotel room per night. Which is better Cinque Terre or Portofino for a vacation? The choice depends on the experience you seek, our opinion: Portofino is a small and beautiful old port town that became famous as a resort for the rich and famous in the 1950's. Today it makes for a pleasant short excursion to look at the movie-set pretty town, the tiny harbor with giant boats, the surrounding landscape, and to have an expensive drink. Choose Portofino for a half day's amusement. How Portofino Became Famous. Cinque Terre is a more diverse area with five villages in a large coastal National Park. It's suitable for hiking and other outdoor activities and exploring villages in an affordable milieu. Choose Cinque Terre for a visit of one to five days. Are the Cinque Terre villages rundown? Absolutely not. 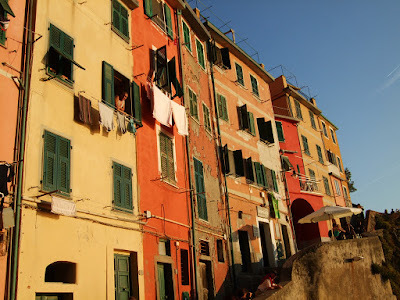 The color of most of the Cinque Terre buildings' exteriors is incorporated in the final layer of applied stucco. This gives a somewhat faded appearance over the decades that enchants most visitors and may fool the naive. 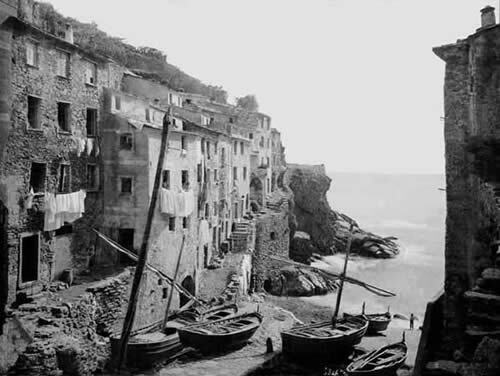 Adding color is a relatively modern addition, see the photo nearby of Riomaggiore from the late 1800's. Is the Cinque Terre gay friendly? Italians and Ligurians have been hosting tourists for centuries and they are open and welcoming. Italians pride themselves on treating others personally and with respect. We have been following Cinque Terre and Ligurian news for decades and have never heard of discrimination of any type toward gays. It is true that Italy has not been progressive politically on gay rights, but that is not an indication of attitudes toward individuals. You probably won't find any gay scene in Cinque Terre, but you will certainly find respect. Is it safe in Cinque Terre? Is a woman travelling alone safe in the Cinque Terre? The Cinque Terre is even safer than the rest of Italy and women alone should have no special concerns. Crimes against tourists are virtually unheard of with two exceptions: pickpockets and bag theft. Pickpockets around trains, train stations, and in crowds are a real problem in Europe as well as on and around the Cinque Terre trains. Local Italian police have a special unit for pickpockets and still the problem persists. You need to guard against it with a neck safe or money belt, and by guarding against your bags being opened or grabbed, especially getting on or off trains or sitting in an outside cafe or restaurant. For an extensive discussion of products: RS Forum: Bags & Money Belts . If you intend to buy, you can help us and yourself. See the Amazon ad below or start here: Anti-Theft Neck Travel Wallet (for UK: Click). Can I get cellular phone service in the Cinque Terre? Cinque Terre coast from the loggia of San Pietro, Portovenere. Yes, there is good cell phone service in the Cinque Terre. As with any hilly area, it can be patchy but the area has good coverage overall. The three major carriers are TIM, Vodafone, and Wind. They all have stores in La Spezia, and TIM has an affiliate in Levanto. To find stores in Italy, Google 'trova negozio' plus a company name. If you are coming from the USA, we've seen favorable reviews for iVideo which rents a cell phone that connects to Vodaphone. Is there public wifi / free internet access in the Cinque Terre? Yes, it’s easier to find free wifi internet in Cinque Terre than in most rural places. It’s offered by many commercial establishments in the villages. Access to the Park's wifi hotspots near the train stations is included with The Cinque Terre card. More useful is Liguria Free Wifi available all over Liguria and in four of the Cinque Terre villages (not Monterosso) and on some of the trails. Liguria Free wifi is a brilliant initiative by the Region of Liguria which we wrote about here Liguria Free Wifi. Is there a good app for the Cinque Terre? The free app that carries the logo of the Parco Nazionale delle Cinque Terre called "Cinque Terre Hiking Guide" and also called 'Pn5t Plus' available free for both Apple and Android devices. We recommend it to all hikers. It has several excellent features and the Park intends to add more features over time. One can enter their Cinque Terre Card number to facilitate additional features. It allows you to see an overall trail map as well as individual trail maps and to see your position on that trail. The trails also have word descriptions (in English) illustrated with photos at key points, and other goodies including distances, elevations, where to get water, and dialing for assistance. Can we drive to the Cinque Terre villages? Practically speaking you should try hard to avoid driving to the Cinque Terre villages. The roads down to the villages are narrow, the turns sharp. and the parking difficult. OK, it's possible, but you don't gain anything - you can't use the car to get around and you'll take the train or ferry between villages anyway. Bonus info: driving to Corniglia and Vernazza is extra horrifying and your kids/spouse might not forgive you. Parking in Monterosso is possible, but limited and expensive. Are there ZTLs in the Cinque Terre villages? Yes. The centers of all of the Cinque Terre villages are either ZTLs (Zones of Limited Traffic) or no traffic is allowed at all. In Monterosso, one can drive to parts of the new town (Fegina). Can we drive around the Cinque Terre Park? Yes, and the driving along the hills of the Cinque Terre Park is beautiful. The high state road (SP370) coming from La Spezia runs parallel to the coast and gives excellent views and you can park at some of the turnoffs for a scene, a picnic, or a hike. The road narrows near Volastra and turns into SP51, going north, and the turns are sharper, but it's manageable. The roads descending to the Cinque Terre villages however are more difficult and they are the reason that we warn folks not to drive. Then select 'Map View' Drag the map and use the +/- buttons to see all nearby accommodation. Where to park to see the Cinque Terre? Where can we park our rental car when we stay in Cinque Terre? For one night or two nights while staying in a Cinque Terre village, we'd choose number 1. For more nights, we'd choose number 2 - people really like Levanto and you're taking the train between villages anyway. Number 3 is a long curvy drive on narrow roads, parking costs more, and you're taking the train between villages anyway. No matter the choice, don't leave anything in the car overnight that's essential to your trip and don't ever leave any belongings visible from outside the vehicle. Centro Park entrance. La Spezia Train Station. Where to park in La Spezia when visiting the Cinque Terre? In La Spezia there's a modern secure Centro Park facility under the La Spezia Centrale train station (23€ or 18€ with reservation per day 1/2018), and 200 m. away from Centrale there's also a Private Parking facility (12€ per day 1/2018). There's a modern secure outdoor lot at Porto Mirabella quite near the dock for the Cinque Terre ferry. There's a new modern secure underground parking facility under Piazza Europa close to the waterfront (15€ per day 1/2018). There's free outdoor parking at Piazza d'Armi and PalaSport at differing distances from downtown. The moderately priced Hotel Corallo has their own parking garage and the location's fairly central. The CDH Hotel has a few free places outside and additional secured paid parking and the Hotel Genova also has a paid parking garage - both are in the centre of town . The Albergo Venezia & Hotel Firenze-Continental are near the train station and its parking. Secure means with video surveillance – but still don't leave anything in the car overnight that's essential to your trip and don't ever leave any belongings visible from outside the vehicle. 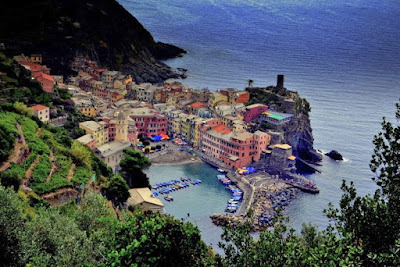 Where to drop off a rental car to see Cinque Terre? We'd say if you will be driving less than two hours or so, drop it off at La Spezia unless you're arriving on the weekend. If you're coming from afar, drop it off where ever you are and take the train to La Spezia since you'll use the train to reach Cinque Terre anyway. Click for our article with map for info about the La Spezia rental car offices. Where to rent a car when we leave Cinque Terre? We also recommend the reputable car hire brokers Auto Europe or its subsidiary, Kemwel Discount Rentals. They allow you to compare companies, get zero deductible insurance if needed. If you will be renting a car, please consider our Links below (which do not affect the prices offered). Is the Cinque Terre handicapped accessible in a wheelchair or walker? In our view, the Cinque Terre are not generally accessible to someone in a wheelchair or walker. We think there are better choices for pretty Ligurian visits - see the question below. Perhaps the biggest obstacle is getting there. While all of the Cinque Terre train stations have elevators now (not self service) the train stations still involve stairs. See this discussion: TripAdvisor Forum on CT Access. Once there, accessibility does vary by town with a large part of Monterosso being accessible, but the other villages much less so. There have been some improvements – – but overall there are many obstacles. The Cinque Terre ferry company does not recommend wheelchairs or walkers as access to the boats is via a gangplank at several of the ports. 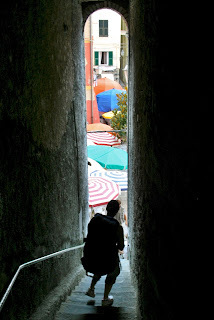 Are there many stairs in the Cinque Terre villages? Yes, the commercial establishments and lodgings of Cinque Terre are almost all in narrow old buildings with some stairs to enter and staircases to the upper floors. Very, very few of the old buildings have elevators. The train stations in Riomaggiore, Manarola and Vernazza are toward the high end of the village, and the stone-paved street then descends toward the sea, sometimes with sections of stairs. In Corniglia the station is below the town and there are 365 stairs to climb or one can use a shuttle. In these towns, getting one's baggage from the train station to lodging can require considerable effort or a pre-arranged porter. What is the most accessible town in Cinque Terre for a traveler with a disability? The most level and accessible village in Cinque Terre is Monterosso. It has an old part and a modern section (called Fegina). The train station is between them and is about 20 steps above the seaside boardwalk which is level, and there is some limited taxi service. There are at least eight hotels with ground level entrances and elevators in Fegina. Link: Monterosso on Booking.com See 'Filters' on the left for 'Facilities for Disabled Guests'. We use Booking.com for verified reviews, good search filters, and clear cancellation policies. What nearby Ligurian towns are suitable for someone with impaired mobility? Up the coast, Sestri Levante is a popular resort with a small but pretty old town. It has a long, level promenade along the beach leading to the old town which is also level. There are numerous modern hotels nearby. It has train service and a Cinque Terre boat tour available. Levanto is a small city just north of the Cinque Terre and is mostly level with an old town, an extensive beach, and parks. There is a level, paved bike/pedestrian path through old rail tunnels that provides some unique views of town and sea which extends several miles up the coast. Levanto has numerous hotels and restaurants and gets enthusiastic reviews from many Cinque Terre visitors. It has both train service and Cinque Terre ferry service. Lerici with its Castle and part of the harbour side lungomare. The town of Lerici is wrapped around a series of little bays on the Gulf of La Spezia. There are many stores, cafes, parks, beaches, and restaurants along the level road facing the sea (lungomare). Some of the older part of the city, including the castle, are on the adjacent hillsides. There are at least five hotels along the lungomare, such as the Link: Hotel Florida across from lovely Venere beach. Lerici has good bus service from La Spezia or it costs about 30 Euro via taxi. There is Cinque Terre ferry service but no train service. Of course we have an article that will make you fall in love: Castle to Castle Along the Gulf of the Poets. The central business district of La Spezia is entirely flat, including the waterfront, the Cinque Terre ferry dock, and many of the hotels. The train station is a bit elevated but there's a road leading up to it that's not steep (though there are stairs to some rail platforms). Several of the area's streets are car-free for easier access. We have not surveyed the availability of curb cuts, ramps or lack thereof. The Link: CDH Hotel is fairly modern and has direct access to the Via Prione, a popular pedestrian way, with elevator access to the lobby and it's fairly close to the train station. 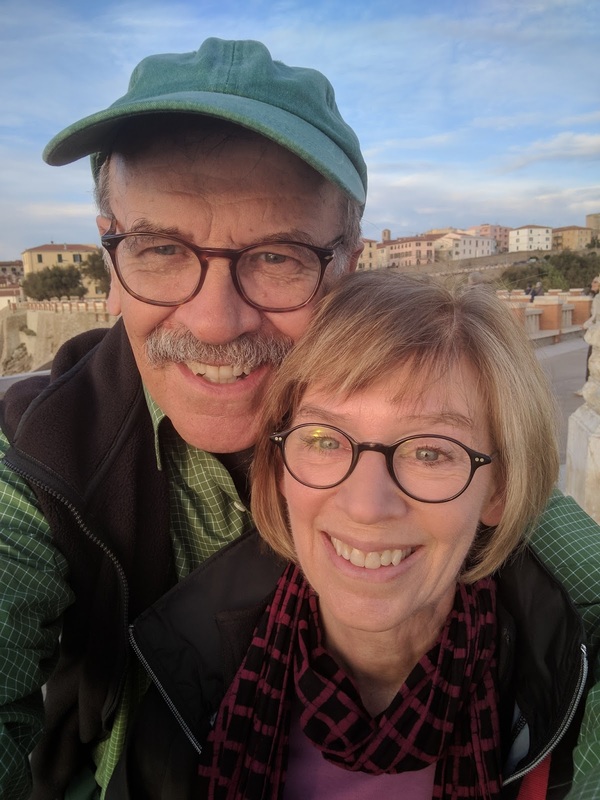 We are Mike and Martha from Boston and we have visited Italy over 50 times in the past 30 years. We are retired photo editors and we've had an apartment eleven miles by crow or drone from Cinque Terre for over 25 years. We know the Cinque Terre well and we keep current by reading the local news and travelers' forums and keeping up with travel websites. We also maintain the web's only archive of Cinque Terre ferry schedules to help people off-season. We hope our information will help you have a great trip. When planning, remember there are no right choices, just different pleasures. Buon Viaggio. If suitable, you can help us by using the links we provide. Using the links does not affect the prices offered. We receive no money or free stuff for writing our articles or opinions. We do receive a standard internet commission for some of the purchases made through a clicked link. Those commissions help support this website and (occasionally) local vintners. We often use Booking.com because we like the verified reviews, good search filters, good maps, and clear cancellation policies. Use of the link helps pay for this site. Photos captioned 'CC By' or 'CC' are used through a Creative Commons license and can be found on Flickr. Uncredited photos are copyright by us. Written by Martha and Mike. All this stuff is Copyright 2019 by Amendola Media LLC except as otherwise noted. *Source: Citta della Spezia (a news website) 2 May 2017 Photos of CT crowds at end of the story.